Okoawo BlueGate: A Petrol Tanker Just Caught Fire And Exploded At Conoil Gas Station Opposite The NNPC Building In Abuja. 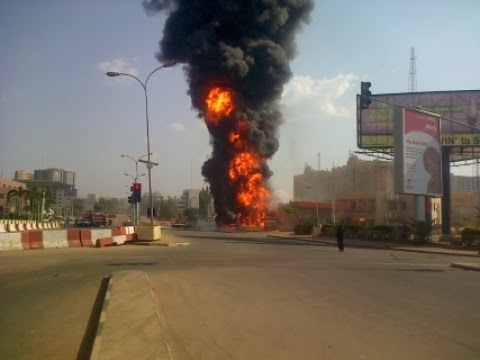 A Petrol Tanker Just Caught Fire And Exploded At Conoil Gas Station Opposite The NNPC Building In Abuja. According Sahara Reporters, a petrol tanker discharging fuel caught fire and exploded shaking several buildings across from the offices of the Nigeria National Petroleum Corporation building in Abuja just . 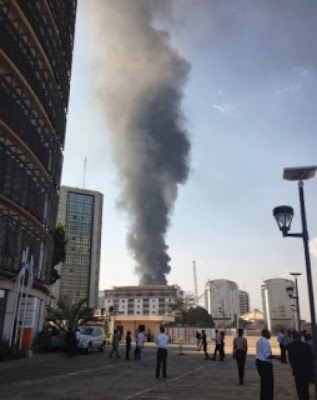 Eyewitnesses that a petrol tanker discharging gasoline exploded at the Conoil gas station opposite the NNPC building in Abuja. The huge fireball could be seen in areas around Abuja. There is no immediate report of casualty caused by the explosion. More updates as they become available..